One thing we always look forward to as a fitness equipment distributor is seeing our products and equipment branch out into different markets and fields for various different uses. Corporate marketing events are a huge opportunity for our equipment and it is a great chance for people to try out interactive fitness equipment that otherwise might have never of heard of it. Recently we delivered a T-Wall 32 to a marketing event for NASCAR, which was a ton of fun. 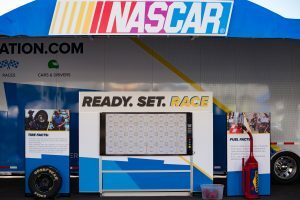 This is actually the 2nd year in a row that the NASCAR organization has used Exergame Fitness to get a T-Wall for their event. The machine produces tons of noises, lights, and gathers a crowd – all of which are essential for keeping attention at these events. 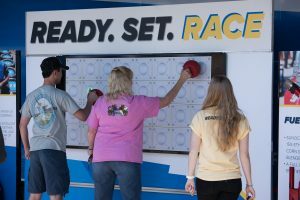 The T-Wall has been a huge help for the NASCAR organization in making this event ‘interactive’ and ‘engaging’ with our interactive fitness equipment, but most importantly, it is fun. Exergame Fitness doesn’t just deliver equipment to YMCAs and health clubs – our equipment is for everyone. Besides NASCAR events we have provided interactive wall games and interactive projection games for both Exxon-Mobil and Nickelodeon – which have been great for both organizations. It is great for us because like before – we are getting exergaming out to more people who can capitalize on it and use it. On the customers’ side, this is something unique others simply will not have. People will remember going to your event and playing on a T-Wall or EyePlay, it makes a lasting impact on the attendees of any event or trade show. We are about a month away from the annual National Recreation and Parks Association Conference in St. Louis, MO. We will be located at booth #2604 and will the T-Wall 64 and plenty more for you to test out and play on. Follow us on Facebook and Twitter for more exergaming and fitness industry updates!